We serve clients that range in size from small and mid cap to Fortune 500. These clients cross all industries and are in various stages of the business cycle. In our role as outside advisor, we typically serve and report to the Compensation Committee. We simplify the complexities of the executive pay process, educate our clients and constituents and clarify the strategic elements of compensation. We also strive to align compensation programs with company objectives and shareholder interests. 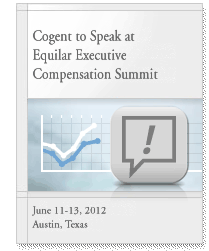 Cogent Compensation Partners is a professional services firm specializing in executive compensation advisory. Our consultants are skilled at helping clients administer programs that appeal to reason, hold up under scrutiny and successfully link executive pay to shareholder value. Cogent Sponsored WorldatWork Webinar: Executive Incentive Arrangements for Challenging Markets. To access the replay click here. To view the Fred Cook website click here. Contact information for the former Cogent office, now Fred Cook’s Houston location, remains the same.